If you think Social Media is about pictures of what somebody is eating for breakfast, think again! Social Media is a powerful business tool when used correctly. So if you are unfamiliar with how to use social media as part of your marketing, here’s an overview on how to get you up and running. Set out your objectives. Are you looking to gain enquiries, bookings, brand exposure or product sales? Whatever your objectives are, set them out before your first post. Choose the right platform to lead with. Each platform (Instagram, Twitter, Facebook, etc) offers it’s own advantage. Do you want to lead with a visual impact? Look at Instagram. If linking to blog posts is key, then Twitter allows this facility free of charge – Instagram charges. If you don’t have a blog or news section on your website, Facebook would work well for you as it does not demand such restrictions on images and characters used on a post. Work in sync with other marketing actives. Are you already campaigning your services using email marketing, paid click advertising or direct marketing? Social media should be kept on brand and relevant to all existing campaigns. How often should you post? Well, ask yourself the same question you would when setting up any marketing campaign; what are my competitors doing? Do some research and check out what is deemed appropriate in your market sector. Schedule your posts. Once you’ve finished researching and considered your competitor activity level, a decision needs to be made. How do we generate content and who will generate that content? Let’s say you need to post daily, Do you have the capacity in-house to generate that level of content? If you think that you do, will it be a high enough quality? These considerations need to be made when compiling your content funnel. The ideal team. Our experience at Swimming Hippo is that working along with an in-house team is the ideal solution. This is certainly what we have experienced with www.anarchy45.co.uk a recently opened group-fitness studio. 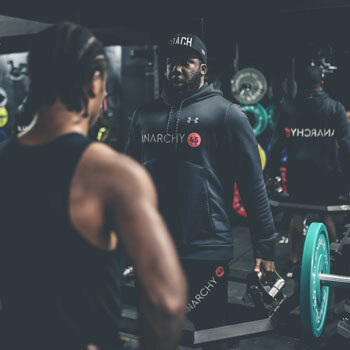 Anarchy45 have an in-house team that generate photography and ‘behind the scene’ Instagram stories while Swimming Hippo make sure that the posts on Instagram, Facebook and Twitter remain on brand and professional, sticking to the objectives set. "Working with Swimming Hippo has re-aligned our Social Media to work with our brand values and to achieve key marketing objectives. Manos, Claire and Kieren work with Joseph and his team at Swimming Hippo to deliver a direct and compelling Social Media experience for our followers."